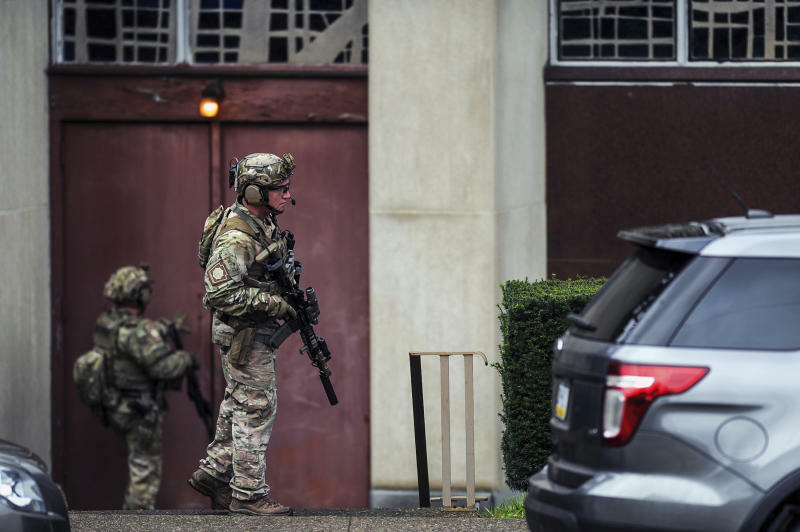 NEW YORK (AP) — Law-enforcement agencies around the U.S. deployed extra officers at synagogues and Jewish centers on Saturday in response to a shooting that claimed 11 lives at a Pittsburgh synagogue. Police in New York, Los Angeles, Chicago and other cities said that while they knew of no credible threats against houses of worship in their communities they were stepping up patrols nonetheless. Authorities say gunman Robert Bowers, a virulent anti-Semite in social media posts, opened fire during a service at Tree of Life Congregation in Pittsburgh Saturday morning, killing 11 and wounding six. In New York City, Chief of Department Terence Monahan said officers equipped with heavy weapons had been sent to houses of worship. "In addition, NYPD officers in every precinct throughout the city are visiting sensitive locations to ensure the safety of all New Yorkers," said Monahan, who joined Mayor Bill de Blasio and other officials at a Manhattan synagogue. "We will be having a strong presence at community institutions in the days ahead and it's important for people to know that we regard this as part of a solemn duty in this city," said de Blasio, a Democrat. Chicago Mayor Rahm Emanuel, also a Democrat, and Police Superintendent Eddie Johnson said in a statement that the Chicago Police Department "is closely monitoring the situation and providing special attention to all synagogues throughout Chicago." The Los Angeles Police Department said that "out of an abundance of caution you will see extra patrols around houses of worship today." In Houston, the Harris County Sheriff's Office tweeted, "Deputies will be closely monitoring synagogues throughout the weekend to ensure worshippers' safety, in light of today's mass shooting in Pittsburgh." The Philadelphia Police Department said, "As we continue to monitor the situation in Pittsburgh, we are sending officers to Synagogues and other houses of worship across the city." Rabbi Arthur Schneier, the senior rabbi of Park East Synagogue in Manhattan, where de Blasio spoke, recalled that as a child in Vienna he watched his synagogue burn during Kristallnacht in 1938. "Those who burned the synagogues burned my family in Auschwitz," said Schneier, 88. He added, "In Vienna I stood by when my synagogue was burning and the police and fire didn't worry about it saving that synagogue. They were worried about neighboring buildings. So God bless all the men and women of our police, FBI and state troopers."